Oktoberfest is one of the things that Helen is famous for! Oktoberfest is an annual tradition designed to express Helen’s roots as a German town.This is the world’s longest Oktoberfest and our festhalle runs daily with music, dancing, German biergarten, and food. The chicken dance is a popular German dance and is played often.The festival runs from mid September to the end of October. There is even an Oktoberfest parade which celebrates many of the local business in the Helen area. Great food, awesome drinks. It isn’t an Oktoberfest without lots of food, wine, and beer! Wait until you get your hands on some roast pork or roast chicken and gravy. Traditional Oktoberfest food includes a variety of delicious meats, sweet apples, bratwurst, yeast dumplings in vanilla sauce, and jumbo pretzels! The original Oktoberfest was actually a two week long party celebrating the royal wedding of King Ludwig I and Princess Therese in Munich, Germany, way back in the day of 1810. Celebrating the last few weeks of September, all the citizens of Munich came out to the festivities including amusement rides, horse racing, games, and of course lots of food, wine and beer. How did this come to Helen? Helen was transformed into a little German town in 1969 in an effort to revitalize the town. 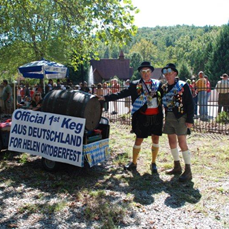 In 1970, the first Oktoberfest Festival in Helen was held. Today, thousands of people from across America and the world come to Helen to participate in the German tradition each year. A common occurrence during this time period is seeing lederhosen and dirndls. Lederhosen are traditional German pants and men can be seen wearing them. Lederhosen are made of leather and can either be short or knee-length. Dirndls are worn by women and is the traditional dress for women. The dirndl consists of a blouse, apron and full skirt. If you do not have any of the above, come as you are! 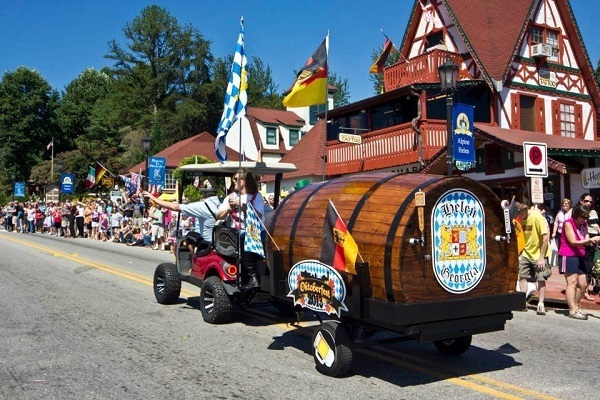 The annual Oktoberfest Parade takes place on the first day Oktoberfest. Following the parade is the Tapping of the Keg, opening the celebration for the following weeks! The Helen Festhalle is host to the Oktoberfest festivities, complete with music, food and drink, and the beloved "chicken dance" that typically happens after consuming a bit of Oktoberfest beer. If you have never experienced Bavarian-style beer hall music, you are in for a treat. During Oktoberfest, traditional German bands from all over, including Stratton Mountain Boys and the Alpen Musikanten will head to Helen in name of the celebration. Get ready for the most jubilant dancing to the most contagious music! During Oktoberfest the place to be is the Helen Festhalle. Cabin Rentals of Helen usually sells out for this celebration. 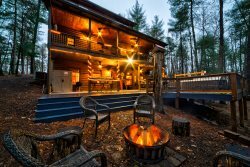 It is usually best to call several months in advance to reserve the cabin you want. Check out the Helen GA cabins that we have in town close to all the Oktoberfest festivities to make your selection.